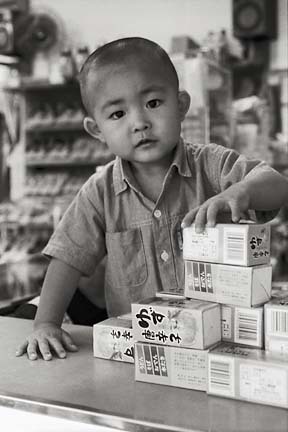 This boy was playing at a small temple store counter while his mother and grandfather tended the store. When I started taking his photo, the mother had a huge smile and kept ducking. Oblivious to his mother's anxiety the boy continued playing, only occasionally looking up. This is when I snapped the shot.